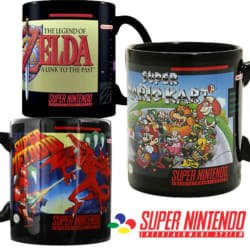 As one of its daily deals, 13 Deals offers three Officially Licensed Super NES Heat-Activated Mugs for $17.97 with free shipping. That's tied with our expired mention from two days ago and the lowest price we could find by $18 today. It includes Legend of Zelda, Super Metroid, and Super Mario Kart mugs. Deal ends today.